1250 Woodruff Ave., LA CA 90024 lasted 184 days on the market before receiving it's final accepted offer on 9/24/09. The home was listed on 2/25/09 for $1,495,000 and received 2 price reductions during the listing term. Additionally, the property was in escrow more than once during the listing term. The home closed on 11/3/09 for $1,145,000. According to the MLS, the home is a 3 bedroom / 3 bath, 2,525 sq ft home on a 7,020 sq ft lot. The property is being sold as a trust sale with no court confirmation needed. The property is well landscaped and looks to be in good condition. The interior is slightly dated, so I would classify this property as a light cosmetic fixer. What I like about the house is the public rooms are generous sized and it has a good size backyard with grass and a patio. 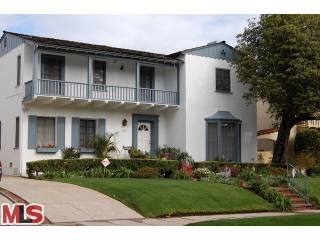 Lastly, the home is situated on a very nice street just south of Wilshire.